What’s the Best Cup for Baby? I’ve tried a lot of cups. Don’t we all? Here are the three key rules I now live by when finding the perfect cup. There is no such thing as a perfect cup. It was small and had the handles so she could easily hold on to it. I gave it to her at 7 months to “play” with and discover how it works on her own. I like to introduce new things to her early, before there is any need or stress in using them so she is comfortable with whatever the change is and she has time to adjust. The first time she held the cup im sure she chewed on the straw for a few minutes and then tossed it to the side. I would continually put 1 – 2 oz of water in the cup for every meal so she could practice. A few days later (it took maybe 2 – 3 days) I looked down at her and the front of her shirt was soaking wet. Considering the cup was empty I knew she had discovered how to get the water up the straw… but not so much how to swallow it quite yet. 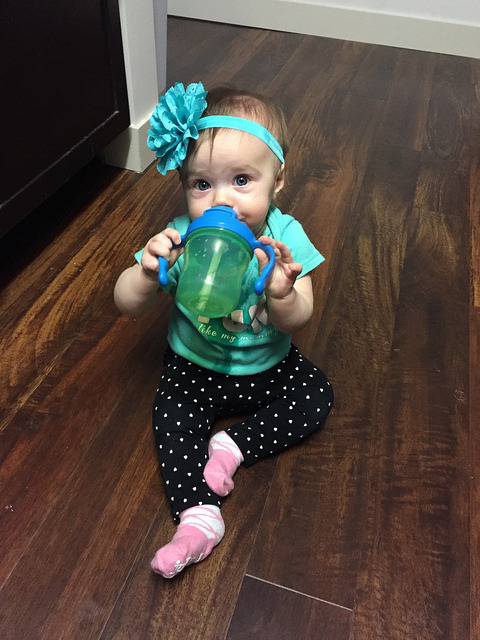 I was still breastfeeding her, she had no need to learn to use this cup, but I continually offered it to her and every day she got better at using straw cups. 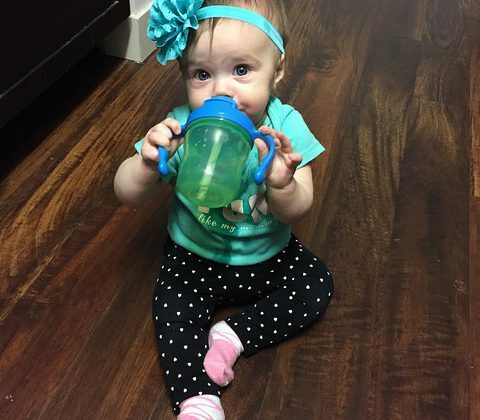 As she got older and began to wean herself, instead of offering her milk from a bottle we would give her the milk in a straw cup and you could tell she loved feeling like a big girl. The key with both these as you can see is the WEIGHTED straw. The straw cups we used before these had straight plastic straws. She would get to the end and we would have to sacrifice the last ounce of milk because she couldn’t get to it. We saved a lot of frustration by switching to the weighted straw. Some moms go to sippy cups before straw cups. We actually did try sippy cups, but since she had been holding the cup down and sipping out of the straw, sippy cups confused her because you had to pick it up and tilt it. We skipped the sippy cup all together because it seemed to make our life easier, one less thing to introduce and transition away from. The less “things” we had to get her to change the better in our minds. Once she was consistently drinking out of a straw cup I introduced the Miracle cup around 11 months. This was another highly recommended cup by a lot of moms and I didn’t understand how it worked until I physically sipped out of it myself. Pretty cool! Again, with no need or stress I let her play around with this cup with water in it, and continued to give her milk from the straw cups. It took her a little longer with this one, but after a few months she understood the difference between drinking out of this miracle cup and a straw cup. I started giving her milk in both of the cups, and honestly the miracle cup is a lot easier to clean, so I prefer this one to the straw cups. As with most kids, Lottie wants everything I had. So while she loved her cups she was always wanting to drink out of my huge CamelBak water bottle. As we know, kids are full of germs and in an attempt to keep those germs out of my cup as much as possible I bought her a water bottle that looks almost identical. For water we now use this Contigo Kids water bottle and she loves carrying this around with her everywhere she goes. What cups do you love/hate? Why? We love the Lollaland cup, I agree the weighted straw is key! Wasn’t that on Shark Tank?! That’s another good one!